CINCINNATI (AP) — Dozens of homeless people were given 72 hours to vacate a downtown Cincinnati encampment consisting of tents, furniture and blankets under an order issued by city officials Monday. Citing health and safety issues, city officials said they will close the site located under an overpass by the end of the week. Residents have until Thursday morning to gather their belongings and leave. Officials will begin to sanitize the area Friday. A city spokesman said officials handed out about 40 notices to residents, mostly men and some women. But they weren’t in a hurry to leave. Instead, they lounged in plastic lawn chairs, joking with one another. Some napped to avoid the midday heat. Supporters drove their cars up to the encampment to deliver donations of clothes, toiletries and peanut butter crackers. Two crates of milk cartons — placed as far out of the sun as possible — spoiled quickly, but people drank them anyway. One camp resident, Latasha Butte, 22, combed through a bag of women’s clothes before spending her afternoon reading. Butte, who’s pregnant with twins, is a relative newcomer to the community below the underpass, but her husband Jeff Stark has lived there on and off for 15 years. Stark said the encampment is just like any other neighborhood, complete with its own local artist and grocery store. Everyone runs errands for one other, sharing whatever they can in exchange. Some residents are adamant they will stay. One man who gave his name as Wow Wow said he plans to stage a sit-in. Others said they’re waiting until Friday morning to decide what to do. On Friday, crews will begin to remove hazardous items such as makeshift bathrooms, contaminated syringes and soiled mattresses, and any remaining items will be considered abandoned, Acting City Manager Patrick Duhaney said in a memo to the city council. City officials should help people find permanent rather than just temporary housing because homeless individuals who live on the streets in such encampments have opted not to live in temporary shelters, according to a recommendation Kevin Finn, president of Strategies to End Homelessness, relayed to Duhaney last week. About 85 percent of Hamilton County’s homeless population already lives in shelters, and local shelters do have the capacity to house more, Finn said. But the rest may prefer making a home for themselves on the streets for several reasons, including substance abuse and mental health issues. 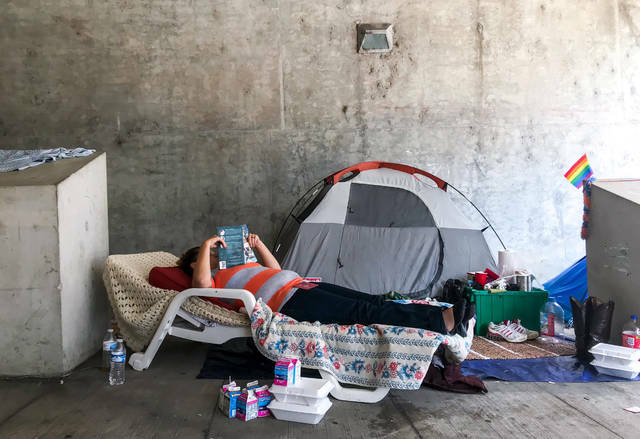 Shelters, which often house upward of 200 people, do not seem livable to individuals with paranoia and anxiety, the most common mental health issues facing the homeless population. Shelters also will not allow those with substance dependencies to use drugs or alcohol overnight. Some couples without children, who are not eligible to live together in shelters, would rather live on the streets than be separated. City officials said they have not studied how much it would cost to permanently house those living in the encampment, but Finn said he estimates an annual cost of less than $400,000 for 40 people — a figure he passed along to Duhaney’s office. In his memo, Duhaney said the city will spend an unspecified amount to fund a temporary shelter. “If the problem is homelessness, the answer is permanent housing,” Finn said. Since 2013, Hamilton County has seen a 42 percent drop in homeless individuals who live on the street, Finn said. Outreach crews that hit the street every day in 2017 counted 979 people, compared to 1,692 in 2013. Over the same period, more have sought housing in temporary shelters. Over the last few years, Finn said he’s noticed that those who sleep on the streets have begun to set up tents and take shelter in more visible spaces because they think they’re less prone to attacks in more open, trafficked locations. But those spaces are also more likely to garner attention and complaints.